For more running routes, see the Route List page. If you're staying in the downtown Las Vegas area, here's a route for you. 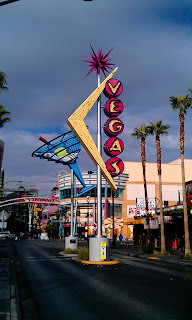 Or even if your hotel is on the southern Strip (Las Vegas Boulevard), you might want to head downtown to see the old Las Vegas, the one with the 50's charm: the great neon signs that have greeted generations of fun-seekers. The casinos here are smaller and a bit shabbier than the modern palaces down the Strip, but they have their own flair. I was back in town this last week, and I thought I'd give this route a try. 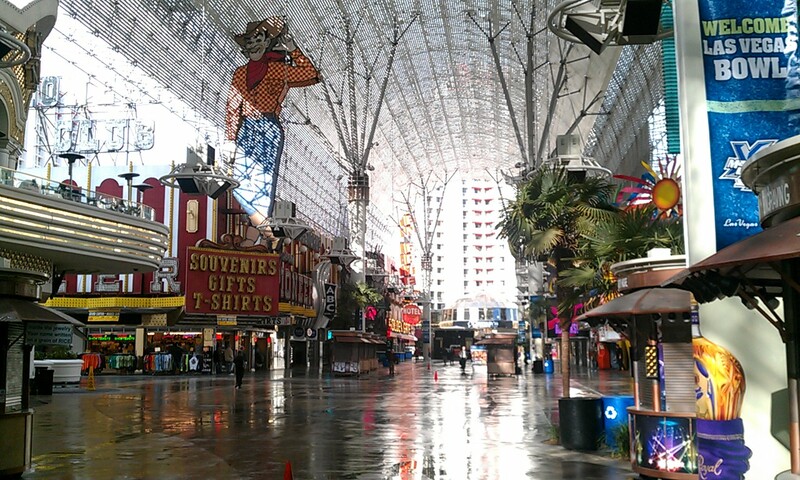 NOTE: It's easy to get downtown: just take one of the RTC buses that head up north to Freemont Street every 15 minutes. 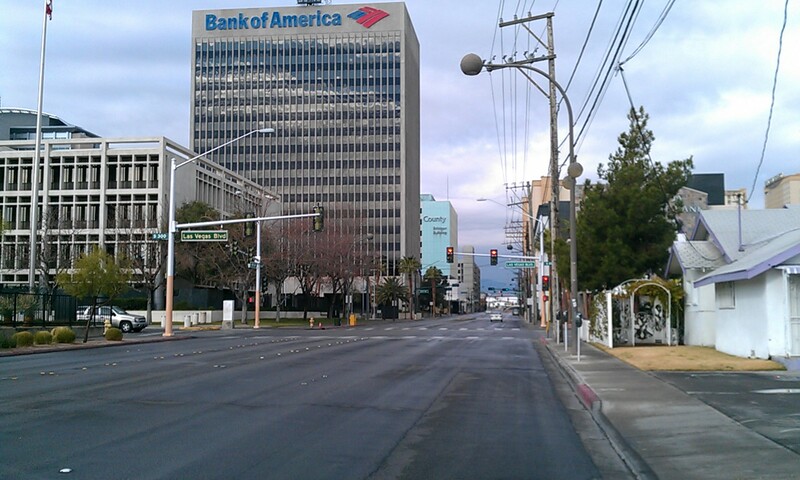 Downtown Las Vegas isn't what I'd call a running-friendly place, with its web of busy streets, lots of commercial property, and total lack of parks. But this route takes you through some of the most scenic parts of downtown, plus heads through the quieter residential neighborhoods southeast of downtown. 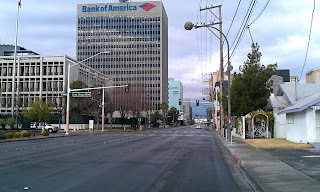 This route starts in the heart of downtown, at the corner of Main Street and Freemont, in front of the Plaza Hotel/Casino. Right in front of you stretches Freemont Street, the center of Las Vegas' original gambling area. This area slid into a steady decline for decades as the southern Strip eclipsed its glitter, but the city has made an effort to revive it by roofing over the whole street and turning it into a pedestrian zone. The curved roof serves as the world's biggest projection screen at night. 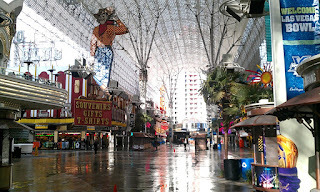 They call it the Freemont Street Experience. The makeover worked pretty well, and the area is now fairly alive and well. Head southeast on Freemont, past Binion's Horseshoe (Las Vegas' oldest gambling establishment, I believe) and a few more famous casino/hotels, like the Golden Nugget, the 4 Queens and the Pioneer Club (now just a souvenir shop). When you come to Las Vegas Boulevard (the Strip) the Experience ends, and Freemont turns into a normal street, open to cars. 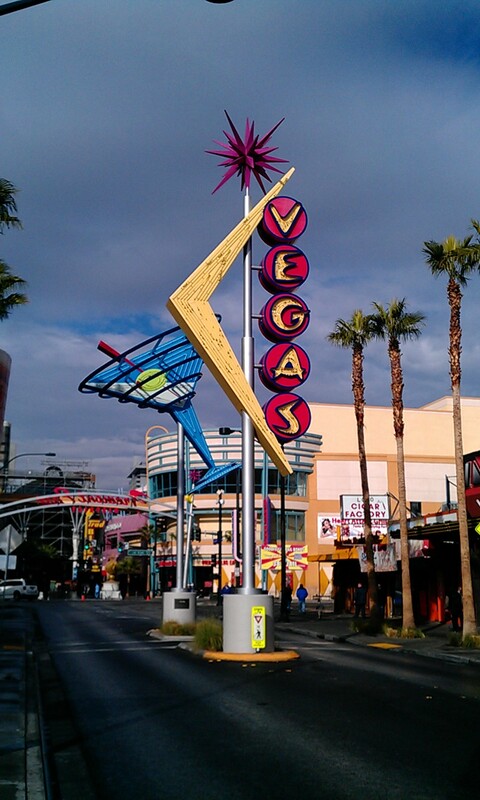 But there, along the next block, the city set up some historic neon signs of long-torn-down casinos. Head straight out along Freemont. After about 9th Street, the street starts to go downhill a bit. This is now a fairly run-down neighborhood, a bit funky, but I consider it safe for jogging. But it will give you a bit of a view into Las Vegas' darker soul: home to many a shattered life, stranded in Vegas, end of the line. But if you go to Vegas, you want some adventure, don't you? In just 3 more blocks you'll turn right on S. Maryland Parkway, to head southwest. This street is a bit more residential already. The street curves a bit to the left before crossing the busy Charleston Boulevard. Cross Charleston and run through the little Huntridge Circle Park that sits in the middle of the road. This is about as big as the parks get around here, and it marks the beginning of the quite pleasant John S. Parks neighborhood. 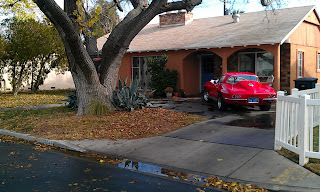 The neighborhood is refreshingly normal, full of little middle-class bungalows from the 1960s. You could certainly come back here for more runs to explore the whole neighborhood. It stretches from the Strip in the west to Freemont in the east, and from Charleston Boulevard in the north to St. Louis Avenue in the south. At the end of the park, turn right to run west on Franklin Avenue. When you get to S. 9th Street, turn right. We are now on our way back home. Run until the street makes a turn to the left and becomes E. Park Paseo. Run the one block to N. 8th Street, where you turn right and cross Charleston again, going north. When you reach Gass Avenue, turn left and run the 2 blocks to 7th Street, where you turn right again. 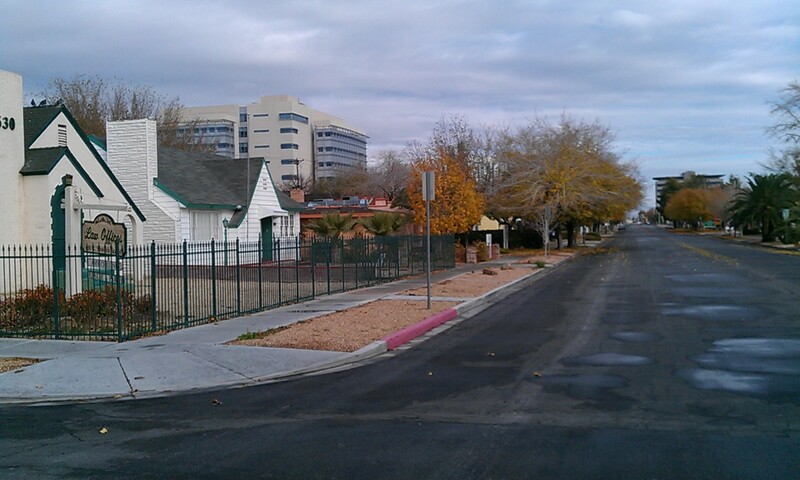 Seventh Street is one of my favorite streets in Las Vegas. 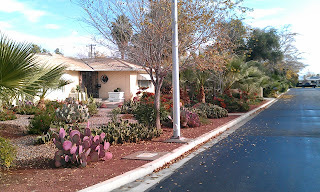 It has lots of trees, and is full of little old 1950's 2-bedroom bungalows. Most of them have been converted into lawyers' offices, showing its proximity to downtown. 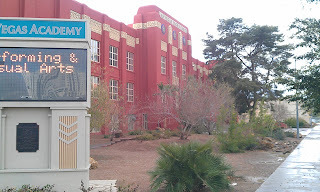 The entire downtown is full of lawyers' offices, bailbondsmen and pawn shops (the "Gold and Silver Pawn Shop" of History Channel's Pawn Stars fame is just a couple of blocks west of here on the strip), again revealing the turbulent state of many of the town's visitors and inhabitants. 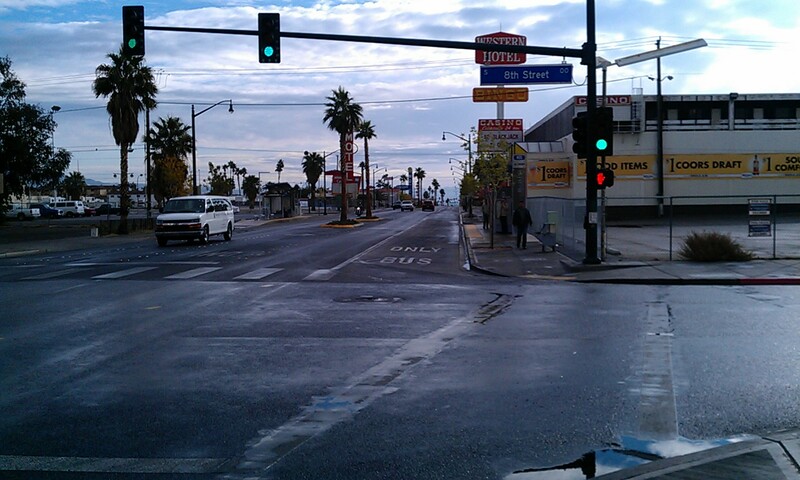 At Clark Avenue, turn left to run the four blocks to the Strip (Las Vegas Boulevard again), just so you can run a bit along this road, even though it isn't very interesting here. This is where the real downtown begins, with its courthouses, banks, county- and federal buildings. 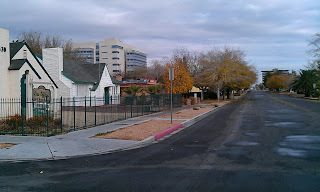 Turn right on the Strip and run the one block past the federal building to Bridger Avenue, where you turn left. 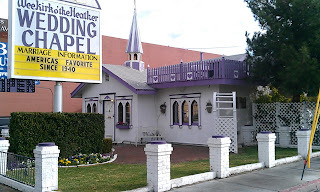 There is one of Las Vegas' many wedding chappels on the corner, the "Wee Kirk o' the Heather", although there is no sign of Scottish heather for the next few thousand miles or so, as far as I've noticed. 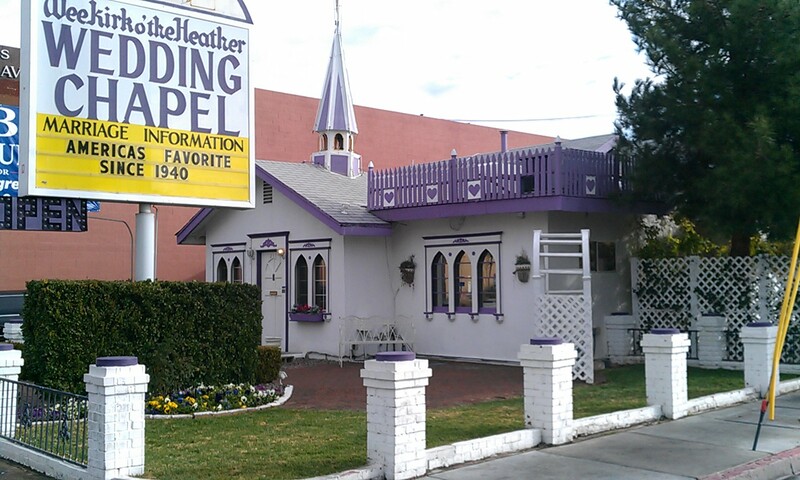 There are other, tackier, chapels in town, looking more like converted Taco Bells than glamorous wedding venues. On Bridger, you'll run past typical downtown banks and county buildings for 5 blocks until you hit the very unscenic Main Street. 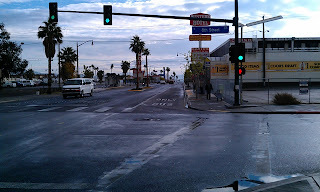 Here, you turn right and run the two blocks back to the start of the run at Freemont. Thanks for this route - I ran it twice this past weekend. The descriptions were helpful. You're right, it was a bit dodgy of a neighborhood around Fremont and 9th, but I didn't have any trouble. Enjoyed the neighborhoods, and seeing parts of Las Vegas that I'd never see otherwise. Glad you enjoyed it, Sandi! And have more fun in Las Vegas! Thanks for this gem of a route, had so much fun running it this morning!